One hundred and fifty years ago, a young woman asked a lady who appeared to her, who the lady happened to be. She received the answer: ”Que soy era Immaculada Conceptiou,” spoken in the local dialect of the girl (neither French nor Spanish, but Provencales), that translates “I am the Immaculate Conception.” Yesterday I stood with hundreds of pilgrims at the Monastery of Our Lady of the Angels in Hanceville, under a beautiful replica of the grotto at Lourdes where Saint Bernadette first heard those words of Our Lady spoken to her, and where these words are engraved under the image of Our Lady at this newly dedicated Shrine. There is something about these outdoor shrines that calls to mind a great reality, namely that when God wants to reach us, God sends His messengers, whether an angel or the Blessed Virgin Mary to wherever we are at the moment. We encounter God in Church, but we can encounter God outside of the Church as well—for “God is everywhere” as we all learned as youngsters from the Catechism. But there is more, and the shrine in Hanceville by imprinting the words “Que soy era Immaculada Conceptiou,” under the image of Our Lady in the Lourdes grotto, reminds us that when God has a message He wants delivered to us it is delivered in our own language. Indeed, how can this be? On this day, in forest, on the banks of the Black Warrior River, I receive the Blessed Sacrament—the Lord Jesus Christ, at this newly dedicated shrine of Our Lady. God comes to us where we are at the present moment, God speaks to us in our language–no matter how simple we are, because God loves us. I have been to the beautiful Lourdes grotto at the University of Notre Dame in South Bend, IN many times. I believe it is the most beautiful spot on that lovely campus. There is a sense of quiet and prayer that pervades that spot, no matter what is going on a few feet away at the busy University. The heat of candles lit, warms you as you approach—making you mindful of the many prayers that have been left behind for God to answer. 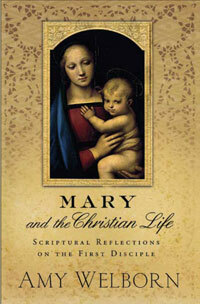 Would you like a free e-book about the Blessed Virgin Mary? Just click here!